MUMBAI: Mohammed Tahir and his wife Zubeida, main organisers of a local Navratri festival, have been celebrating since 1983. 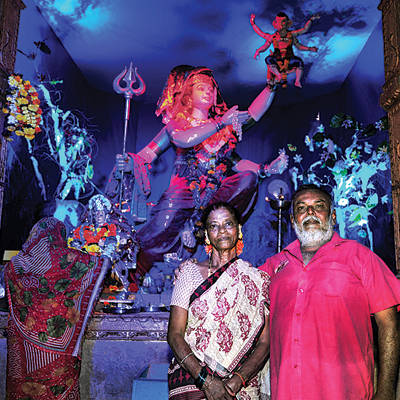 Tahir said that his wife had dreamt of the Goddess and the couple has since been setting up a makeshift temple every year dedicated to Goddess Durga. “Every year, the temple has a different setting. We have made replica of the Balaji, Vaishno Devi Temple in Jammu, Kedarnath and Badrinath,” said Tahir. Zubeida said the temple was for everyone who believed that all religions taught different paths to reach the same God. “It is for everyone who believes in the unity of religions. We all celebrate it together, be it Hindu or Muslim. In fact people from various religions and regions come here,” said Zubeida.